Harold Crooks with Joey Dunlop at the Isle of Man TT in 2000. Highly respected motorcycling journalist Harold Crooks has sadly passed away at the age of 83. The Ballymena man had a long and distinguished involvement in the sport and became the motorcycling correspondent for the Sunday Life newspaper when it was first published 30 years ago. Mr Crooks’ column in the Ballymena Guardian was also widely read and he was an expert commentator, who was based at the start and finish at the North West 200 to provide commentary over the course PA system. A former headmaster at Broughshane Primary School, Harold was also the motorcycle correspondent for Downtown Radio and later worked for BBC Radio Ulster. Belfast Telegraph motorcycling correspondent – Roy Harris – was a close friend of Mr Crooks, who he described as a ‘gentleman’. “Harold was one of the ‘big three’ motorcycling journalists as they were known along with Dermot James and Jimmy Walker throughout the seventies, eighties, nineties and beyond,” he said. “He opened a lot of doors for me in the motorcycling world and we went everywhere together, to all the press conferences and races. “I got to know Harold after the Enkalon Club started. I knew him before I became chairman in 1985 and our friendship just grew and I started to go to races with him and Trevor Armstrong – we went everywhere together. “Harold would never have done you a bad turn and he will be sadly missed. He knew all the big names, like Joey Dunlop, Ray McCullough, Frank Kennedy and Mervyn Robinson at the time. 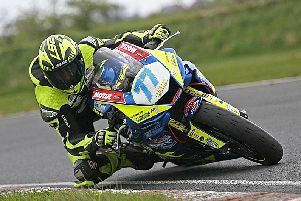 “He was around for a very long time in motorcycling and he was one of the leading lights in the Mid Antrim Club in the sixties before he became involved in the journalistic side of things,” he added. “Harold was a gentleman and he would’ve went out of his way to help me whenever I became involved in the sport. Following a private family burial, a service of thanksgiving for the life of Harold will be held in Wellington Presbyterian Church, Ballymena, on Friday, September 14 at 12 Noon.